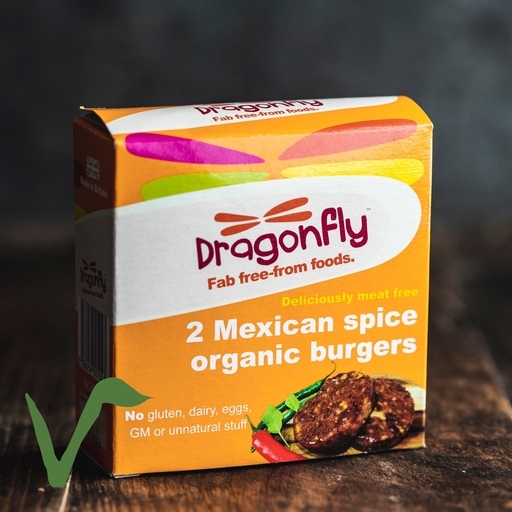 Organic Mexican spice burgers, handmade by our neighbours at Dragonfly – a Taste of the West Gold award winner. No ordinary veggie burgers, these pack a flavoursome punch. Hearty brown rice and beans, our own organic veg for sweet colour, and a blend of Mexican spices for kick. Add crisp green leaves and a dollop of mayo – a simple, satisfying meal. Cooked brown rice (42%), Soya bean fibre and curd (25%), tomato ketchup (tomato paste single concentrated (75%), raw cane sugar, spirit vinegar, salt*, spices), kidney beans, onions, peppers (3%), corn flour, pumpkin seeds, soya flour, sunflower oil, tamari (water*, whole soya beans, salt*, alcohol), sea salt*, chilli powder, ginger, stabiliser guar gum, cumin, black pepper, garlic powder.